Vladivostok City Administration (Russian Federation) / Vice Mayor / VAKUSHEV Vitaly P.
We, on behalf of participating cities of the 6th Asian-Pacific City Summit, held between 30 November and 2 December 2004 in Bangkok, to exchange views on our "New Approaches Towards Sustainable City Redevelopment" and to explore possibilities to further cooperation among our cities towards shared prosperity in Asia-Pacific and beyond, hereby present "Bangkok Declaration" summarizing our shared visions on the followings. 1. We reaffirmed our good wills to promote close and cordial relations between our cities. The Summit has enhanced dynamic interactions and forged a forward-looking strategic partnership between participating cities. We agreed to push forward our cooperation in the next Summit to be held in 2006 to work towards a future framework of cooperation with the possibility of establishing a common plan of action, including joint projects and activities. 2. We unequivocally supported the substantive ideas from our previous summits. We concurrently recognized that, as the world constantly experiences dynamism, especially as the result of the on-going process of globalization and interdependence, our cities are growing at unparalleled rates. In view of these we stressed the necessity of continuously refining and revising our approaches towards sustainable city redevelopment. We also emphasized the values of utilizing the comparative advantages of our cities such that their different strengths complement each other. 3. We reaffirmed our commitment to good governance in our new approaches, which accordingly attaches great significance to comprehensive and non-discriminatory public participation in the decision making and assessment processes as well as transparency of the administrations. 4. We stressed the need for the private sector to play an important role in the sustainable redevelopment of our cities. We believe that efficient public private partnership will make our new management effective. 5. We also emphasized the importance of market-oriented methods in our new approaches while integrating these methods with the principles of good governance and public private partnership. Our approaches should apply market mechanism and competition to raise the quality of life of the peoples in various aspects, including provisions of goods and services, education, healthcare, infrastructure and environmental management. 6. We pledged to intensify our own efforts as well as inter-city cooperation towards the common goal of more opportunities and less problems for the peoples. We are to provide the peoples with fair basis of employment, job training, and social welfare. 7. We attached great significance to strategic urban planning and infrastructure investment in our attempts towards better urban living conditions and economic development. Towards this end, we are committed to environmental protection and ecological quality improvement. 8. We aimed to make our cities more and more attractive to both their citizens and visitors. While we are to standardize the quality of tourism industry in each of our cities and integrate tourism strategy with other economic plans, it is in our interests to retain the uniqueness of our cities through elements of our distinguishable tradition and culture. 9. We recognized that different sectors are inextricably intertwined and effective management of each sector and cross-sector issues are crucial for sustainable redevelopment of our cities. We also welcomed future new initiatives of development strategies in other sectors such as sciences and technology, sports, art and culture. We reiterated our common desire to expand our cooperation into these areas and further enhance inter-city exchanges and cooperation in the wider regional and international frameworks. We adopted today our common views and decisions reflected in this 'Bangkok Declaration', which shall mark another significant step towards closer cooperative relations between our cities. We pledged together to maintain the momentum generated by this Summit, to continue our contacts and dialogues, and to develop our friendship and collaboration network. 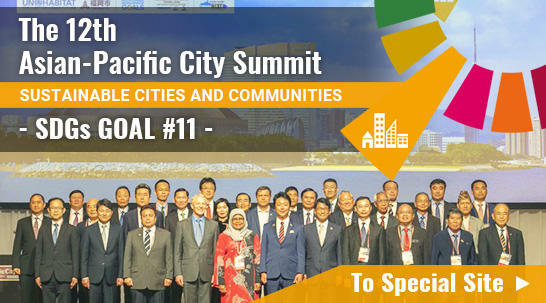 We will hold the the7th Asian-Pacific City Summit in Urumqi in 2006.